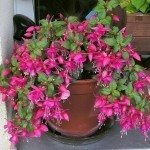 I have bought Fuchsia and Petunia plants online, which I have planted in small pots before I transfer to hanging baskets. Should I pinch out new growth to make the plants bushier? Yes, if you desire more bushy plants, you can start pinching provided your plants have produced at least 2-3 sets of true leaves. Just keep in mind that pinching usually delays flowering.